In The Center Ring: Michael Moore Vs. 'Capitalism' Thoroughly one-sided — and riveting nonetheless — Moore's broadside is a barbed comic monologue with big jolts of pathos. And it's the film he's been building to in all his other polemics. 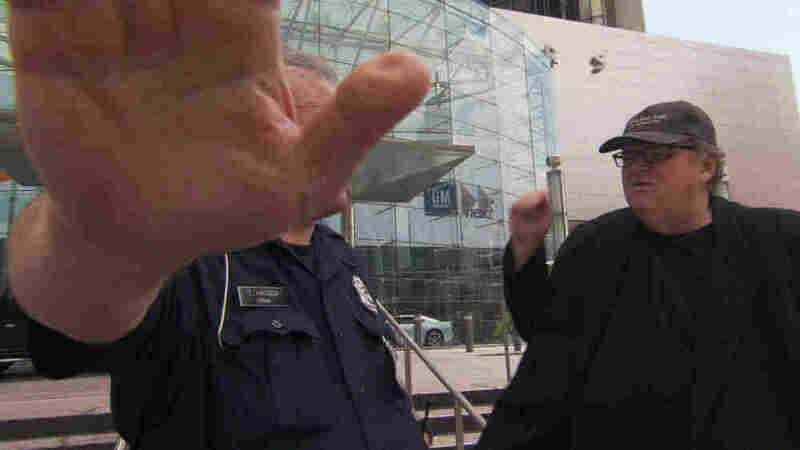 Twenty years after his groundbreaking film Roger and Me, Michael Moore pays a visit to a much-humbled General Motors. Say what you will about Michael Moore: He's a successful left-wing carnival barker in a culture that mostly rewards right-wing carnival barkers. Yes, he has been caught fudging facts. But he doesn't just spew partisan talking points. He's out there on the street, amassing evidence. His new cinematic circus, Capitalism: A Love Story, is the film he's been building to for two decades. It's sprawling, scattershot and sniggering. It's brazenly one-sided. Yet it's riveting. His other films focused on symptoms. This one tackles what he sees as the disease. Let's start with his conclusion: "Capitalism is an evil, and you cannot regulate evil." That's enough to give anyone pause, especially in light of the sorry history of other political and economic systems. He has a less controversial case when he attacks those who portray the connection between capitalism and democracy as sibling-close, united under the umbrella of the Constitution. One of Moore's stunts is a trip to the Capitol rotunda to examine the document. After a Wall Street Journal editor tells Moore that "Capitalism is more important than democracy," the filmmaker quotes the founding fathers on the dangers to democracy of an unregulated market. He also has Jesus on the record denouncing material wealth. As usual, Moore scores most points with satire. He re-dubs an old Bible movie so that Jesus refuses to heal a cripple because of a "pre-existing condition." I wouldn't use the term "documentary" to describe this film: It's a barbed comic monologue with big jolts of pathos. Moore uses a daddy-knows-best tone borrowed from '50s documentaries — This, kiddies, is how our society really works. Some people hate that condescending tone, but I like it. I think it's apt: Moore is a kind of Mister Rogers with 200 extra pounds and a Che Guevara t-shirt instead of a cardigan. As for content, Moore ranges far and wide, although rarely very deep. He begins with foreclosures on poor people and gives a quick sketch of predatory lending. He draws comparisons between the fall of the Roman Empire and our American Century. He makes the case that Ronald Reagan and his corporate allies began dismantling regulations in a way that amounted to a coup d'etat. It got worse, says Moore, under George W. Bush, who took a chainsaw to Wall Street regulations. That's not my metaphor — or Moore's. Bush officials and lobbyists posed with a chainsaw for a magazine cover, setting the stage for what Moore calls the greatest wave of white-collar crime in American history. He doesn't exempt Democrats, either: Bill Clinton also unleashes the Wall Street bull. But while Moore rejoices at the triumph of democracy he says was Obama's election, he doesn't note that the bailout goes on unabated. Among Moore's more appalling segments is one in which he recounts instances in which for-profit businessmen have assumed roles traditionally played by government — like the privately run Wilkes-Barre, Pa., juvenile correction facility that allegedly paid millions in kickbacks to judges who'd put away teens for minor infractions. Moore makes one detour that's exploitive. After a segment on blue-chip companies that earn millions secretly taking out life insurance policies on employees, he introduces a family in which the mother — a WalMart worker — died of an asthma attack and the company collected $80,000. The children read we-miss-you letters to their dead mom and weep. But what's the context? She wasn't failed by the health-care system. He moves in on the crying kids like a ghoul. In the final sequence, Moore pretends to try to make citizen's arrests on Wall Street and puts crime scene tape around the Stock Exchange. On one level: groan. On another: No one else seems about to make arrests. Maybe the image of Michael Moore as sheriff would scare Wall Street straight.